AleaSoft, June 14th, 2018. 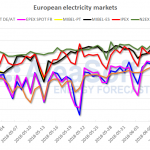 Electricity market prices in France, Germany, Italy and Nord Pool remained at high levels, while the markets of the UK, Spain and Portugal experienced a slight decline. On Tuesday, June 12th, the new European continuous intraday market XBID came into operation, with significant total volumes traded by Iberian agents during the first trading sessions. 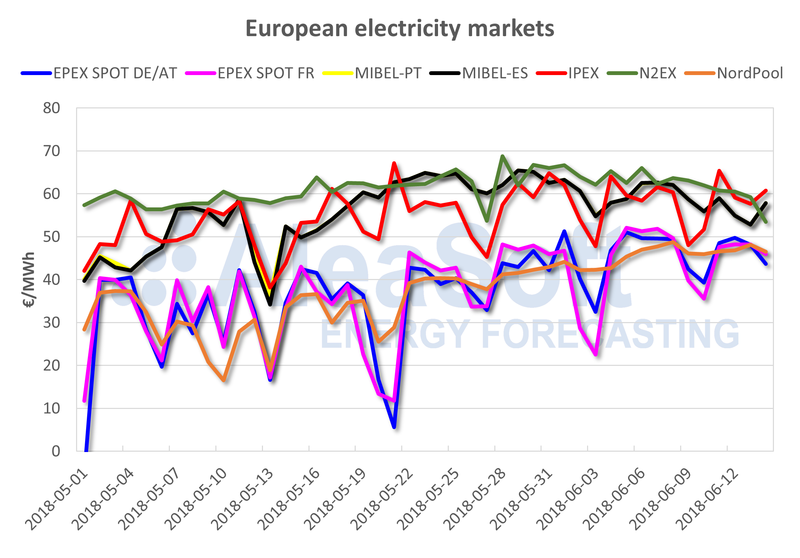 Electricity market prices in France, Germany, Italy and Nord Pool kept their upward trend, behavior that has been maintained since the beginning of May. On the other hand, the markets of the UK, Spain and Portugal experienced setbacks from maximums, in these first two weeks of June. According to AleaSoft, the moderation of prices in some markets in recent weeks is due to the easing of the price of the Brent oil that has gone from a range of around 80 dollars a barrel, in the third week of May, to a range of 75 – 76 dollars a barrel, since the beginning of June. 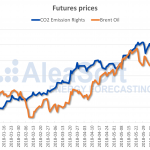 In the same period, the price of CO2 emission rights has stabilized around 15 euros/ton. Since the end of May, the upward trend in gas and coal prices has slowed down. In the particular case of Spain and Portugal, the increase in wind energy production on June 12th and 13th is the reason of the drop of prices down to 52.86 euros/MWh on June 13th, values that were not seen since mid-May when the price climb began, to reach its maximum of 65.46 euros/MWh on May 29th. Sources: OMIE, EPEX SPOT, N2EX, IPEX y NordPool. Temperatures have risen in the Iberian Peninsula in recent days but have still remained below typical seasonal values for this time of year, so there has not been an upturn in the electricity demand. By the end of this week, and especially for next week, AleaSoft expects a significant rise in temperatures that would result in an increase in demand, and an upward pressure on the market price. During the last seven days since last Thursday, June 7th, the prices of Spanish electricity futures traded in OMIP market have remained relatively stable, but with a downward trend compared to the previous week. On Tuesday, June 12th, the new European continuous intraday market XBID came into operation. During the first trading sessions, numerous transactions were recorded with significant total volumes traded by Iberian agents. For the time periods of the valleys, transactions have been recorded at prices clearly below the daily market price for those hours.